Woodbridge Lodge is a beautiful home nestled quietly just walking distance from the Suffolk town of Woodbridge. The home is situated back from the road in our substantial grounds – providing both convenience and peaceful grounds for our residents. The home accommodates people who wish for long term quality care, and provides a comfortable, homely environment, that of love, achievement and togetherness. At Woodbridge Lodge our emphasis is on creating a relaxing ‘home from home’ atmosphere to be enjoyed by the residents and staff alike. At Woodbridge Lodge care home in Woodbridge,Ipswichm Suffolk - our emphasis is on creating a relaxing ‘home from home’ atmosphere to be enjoyed by the residents and staff alike. The home has a flexible approach to daily routines, which enables residents to get up and dressed when they like and have a variety of choice on what to do for the day. We actively promote independence in the home and feel that where possible this should be incorporated in your day to day living. Offering the upmost care, 24 hours a day, you will be fully supported to feel comfortable and well cared for. Our staff are chosen carefully to ensure that you or your loved one are receiving truly person centred care, ensuring all your needs and expectations are met as an individual. We supply a good varied food menu, provide activities and events year round, and offer you choice making sure individual tastes are catered to. There are also other services available within the home such as a weekly hairdresser, chiropodist, therapist on request and an onsite activities coordinator to help organise activities the residents wish to do. However residents are free to spend the day how they wish, whether that’s sitting enjoying the wonderfully landscaped garden, watching TV, reading the newspaper, visiting friends and family or taking a trip out for the day, we do our best to make these things possible. Many residents take pleasure in maintaining the home by helping with the dusting, laying the tables or even serving the meals. This helps everyone to feel part of a team and being proud to live within Woodbridge Lodge. The care provided within the home is that of love, friendship, support and guidance. Staff here are encouraged to form friendships with the residents and truly understand their needs. Many share stories, laugh and cry together, making precious memories at Woodbridge Lodge. All meals served within the home are home made with the freshest ingredients, this provides the best nutrition and taste for all our residents. We encourage healthy living within the home by offering balanced meals and stimulating activities that help boost self-esteem, confidence and of course enjoyment. This is all part of the dedication the home has in improving wellbeing for all residents physically, mentally and spiritually. Woodbridge Lodge is nestled in one of Suffolk’s quaint towns. Its grand Georgian style presence makes the home easily located and the inside instantly presents a homely feel. Step inside and enjoy this tastefully decorated home, which is lit up by natural light. The building features large communal areas such as a beautiful glass conservatory overlooking the grounds, a library, lounge and dining room. Your bedroom can be decorated to your liking and brought to life by personalising the room with treasured possessions. Whilst not all our bedrooms provide ensuite facilities, the home offers two spa baths for the residents to relax and enjoy. The easily accessible building has adequate parking facilities at the front of the home whilst tucked away behind the home holds something to marvel, a wonderful landscaped garden. Its picturesque beauty, with a calming water feature, really is the delight of the home. We take great pride in making sure this is enjoyed by all who reside and visit, holding many events there in the sunnier seasons, or encouraging bird watching from afar come the colder days. Woodbridge town lies along the River Deben, holding a population of around 11,000 and is easily accessible via the A12 or railway line. Although Woodbridge Lodge is not far from the main A12 and the town’s amenities, its large surrounding grounds ensure a peaceful, relaxing setting. Woodbridge Lodge offers residential care with respite care also being offered, but subject to availability. The home is fully equipped with suitable hoists, baths and call bells to assist residents in having the best possible experience during their time within the home. There is also 24/7 visiting hours so families and friends can visit their loved ones anytime they wish, we also welcome lunch reservations in the home should anyone wish to dine during their visit. 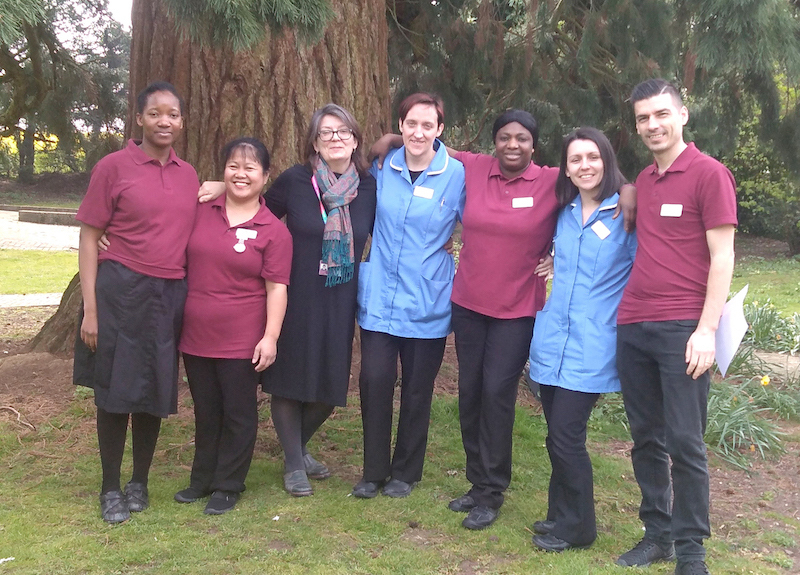 Meet some of the dedicated and caring team at Woodbridge Lodge proud to be making a difference and having a positive impact on the resident’s lives. The team is selected through a very thorough recruitment process, which gives us reassurance that our staff are the very best. They then undertake rigorous induction training, where they are supported and directed to overcome any difficulties they might come across. The team looks after our residents with emphasis on quality of life, and we strive to give purpose to every single day. We realise that the move to a care setting can be a challenging time for those moving and their relatives, and we want to make this process as streamlined as possible. Please feel free to contact the home for any information or advice, and if we cannot help you we will try and point you in the right direction. The safety of our residents is paramount and we can provide reassurance that health and safety issues raised at our last inspection have been thoroughly addressed. The medication cupboard has now been fixed to the wall, as required, and medication guideline documents have been reviewed and placed in a more accessible location. Weaknesses around leadership and communication identified during the inspection have been remedied and Woodbridge Lodge is currently being run by Jill Harris. Meanwhile, the quality of our person centred care and activity provision – both positively reviewed in our latest report – have gone from strength to strength. Come and see us! We would love people from the local community to come and look around Woodbridge Lodge so we can show you all the improvements we have made.